How much will the Remap cost ? This depends on your car as there are so many different variations between manufactures. Send an enquiry through the contact page and we would be more than happy to advise a price. What warranty do you offer ? We offer a 12 month warranty on the software only should an issue arise. We can also restore the car back to standard if there is a problem for testing, diagnostics ect. Can the remapping be reversed ? Yes ! We use the latest technology on the market today. This allows us to restore to the original factory settings at any time. For example, if you want to sell your car with the standard factory settings bring the car back to us and we will do this free of charge. My car is a automatic, can you still remap my car ? Yes it can ! Modern automatic gearbox’s are generally stronger than manual gearboxes. We never exceed the maximum torque limit/rating of the gearbox keeping within the safe design limits. If you have a DSG gearbox fitted on VAG range of cars we can adjust the DSG software lifting the torque value to suit the new engine torque value. Why does my car need Remapping ? When a manufacturer releases a car onto the market it has to be able to cope with many different demands in many different environments. For example, the car has to cope with poor fuel quality, poor servicing and at the same time provide reliability and economy. This means the manufactures have to make a compromise or “detune” your car. In the UK we generally do not have these issues to the extent that the engines have to be detuned so, we have the ability to change them releasing hidden power. Some car manufacture’s use one engine and adjust the BHP via the software, EG, BMW use a 2.0 diesel engine in the 318d and 320d and both models use the identical engines with the power adjusted through the software. This allows us to remap the 318d to the same gains as a 320d. Do you offer a mobile service ? Yes we do ! We can attend your home or work to perform the upgrade. Send an enquiry through the contact page with your postcode and we can advise a quote. 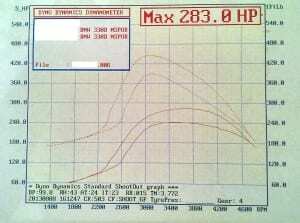 Do you have a dyno ? We have teamed up with a independent dyno operator offering independent before and after power runs. The dyno is located in Chesterfield so we are more than happy to meet you at the dyno and remap your car showing the before and after gains. There will be a charge made for the use of the dyno, typical cost is £50 for a before and after run and includes a dyno print out. Please contact us for this service as a booking time slot will be required. Can the dealer see my car has been remapped ? The simple answer is that some can and some can’t! It all depends on the, manufacturer, the dealer support systems, diagnostic equipment and service staff skills. Most dealers may make visual checks of the car, which would identify that a “tuning box” was fitted, but this would not identify that an ECU remap had been done. Some manufactures use diagnostic equipment to detect remaps, some check my logging fuel and turbo boost pressure values. We do “hide” our remaps from manufactures the best we can, however we cannot guarantee the remap wont be detected regardless of what other tuning companies tell you. Can insurance companies tell my car has been remapped ? Insurance companies, like car dealers, use different methods of discovery when it comes to remapping. Some use dealer computers to inspect the ECU while others physically open the ECU to inspect the soldering on the chip. We advise you to inform your insurance company of any modifications you make to your car, including remapping as this is classed as a modification and must be declared.